Scientists have proposed that the innermost centre of the Earth spins North instead of East. Citing new information from deeper CODA waves as proof. After an Earth quake hits, and the original p d and s seismic waves disappear the Earth is left with a residual vibration, similar to striking a gong. It’s called a coda wave and this echo is what scientists used to unveil the innermost inner core. They analysed auto-correlation of earthquake coda measured by global broadband seismic arrays from 1992 – 2012 and determined that the speed of core-penetrating waves vary at low latitudes of the inner core by up to 10 s. Consistent with the innermost inner core having a fast axis (pole) near the equatorial plane through Central America and Southeast Asia. 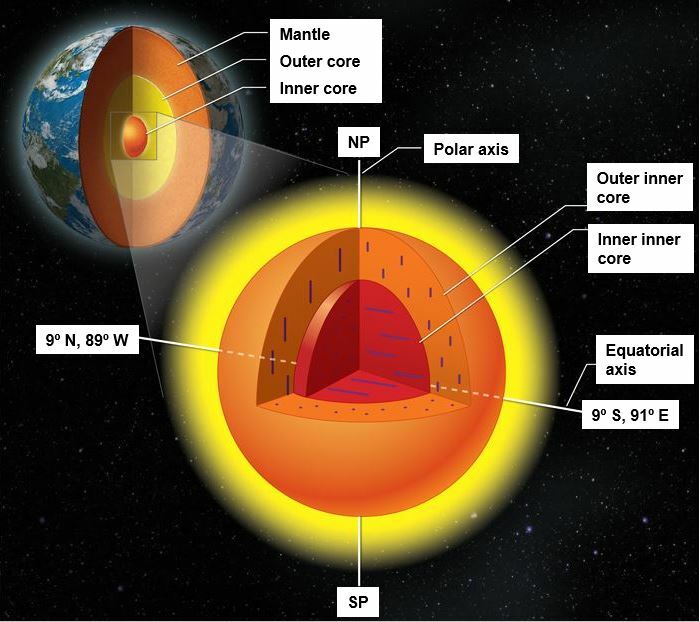 In their published paper tiled “Equatorial Anisotropy in the inner part of the outer core” the authors explain it as the result of the smaller inner cores northerly flow. Back in 2013 scientists from the University of Leeds used similar methods to prove that the outermost part of the inner core spins in an eastward direction – opposite to the molten lava outer cores westward flow. The following is an example of p waves that slow down as they hit the inner core. Allegedly a sign of it’s eastward bound rotation. Each layer inside the planet makes a contribution to the Earths magnetic field which interacts with cosmic rays via interplanetary flux. An extremely complex interconnected system of feedback that we are just beginning to understand. Furthermore, scientists un-involved with the study have suggested that something substantial occurred in the past to’ flip’ the alignment of iron crystals half way through the inner core. On another note, Recent discoveries have also proven that the inner core spins much faster then the outer core, a factor called super-rotation.